I could have sworn there were a lot more of her, but I can't seem to find them. (February 12, 2019, 5:01 pm)rogueangel007 Wrote: I could have sworn there were a lot more of her, but I can't seem to find them. She's "Girl Who Needs to Learn to Clean the Mirror in the Bathroom Before Taking A Selfie". 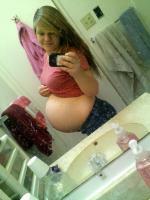 Preggophilia › Pregnant Women › Requests › ID this girl?